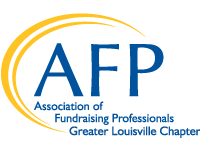 The Association for Fundraising Professionals Greater Louisville is an official chapter of the Association of Fundraising Professionals (AFP), a nonprofit 501(c)(3) organization that represents nearly 30,000 members in more than 205 chapters throughout the world, working to advance philanthropy through education, training, mentoring, research, credentialing, and advocacy. The association fosters the development and growth of fundraising professionals and promotes high ethical standards in the fundraising profession. For more information or to join the world's largest association of fundraising professionals, visit www.afpglobal.org. Fosters international cooperation, knowledge exchange, and education among fundraising professionals worldwide; Uses all necessary and proper means to accomplish our purposes; and Provides a valid and reliable certification program for fundraising professionals.